That's because an entire world exists at the bio-molecular level. Without it, life as we know and understand it wouldn't exist. It's no easy task to actually watch life at the molecular level, and to see individual proteins at work. We managed to do this using a technique called single molecule spectroscopy, which allows scientists to investigate the properties of individual molecules. Photosynthesis is a complex, potentially dangerous process: photosynthetic organisms can die when exposed to too much light. This may sound odd, given that such organisms need light to survive. But it's an excellent example of how too much of a good thing can turn bad. This is why photosynthetic organisms have photoprotective mechanisms, which shield them from too much light. In these systems, it's the interactions between some proteins that determine whether an organism will survive under the full sun or not. And while these systems do the same job – removing the excessive energy from the photosynthetic apparatus in a safe way – they work differently in different organisms. Our latest work allowed us to see how one of these photoprotective mechanisms operates. We studied at an incredible level of detail, one at a time, the protein "antennae" that are responsible for the harvesting of light. Doing so led to an important discovery. We already knew that the main photoprotective mechanism in cyanobacteria involves the binding of a protein called orange carotenoid protein onto the photosynthetic light-harvesting "antenna". This work also revealed that the binding is a complex process which involves an intermediate step. Because the staircase is made out of bricks, it's not waterproof. It leaks: the water drips on the floor at different places instead of reaching the container. In the same way, the photosynthetic antennae leaks a small fraction of energy. By observing these "leakages" using spectroscopy, we have learned about the intricate details of the photosynthetic process. In heavy rainfall, too much water would go down your stairs and overflow the container. The equivalent situation – intense rays of sunlight – is potentially deadly for photosynthetic organisms; they must work hard to avoid this. That's where photoprotective mechanisms come in. The mechanisms we studied work as if they were collecting water from the stairs and safely removing it before it reaches the container. In cyanobacteria's photosynthetic apparatus, orange carotenoid protein acts as the "collector". Our work shows how this protein is inserted into the photosynthetic apparatus to get rid of harmful, excess absorbed light energy. For this insertion to happen, part of the cyanobacteria's antenna system actually detaches for a short time. 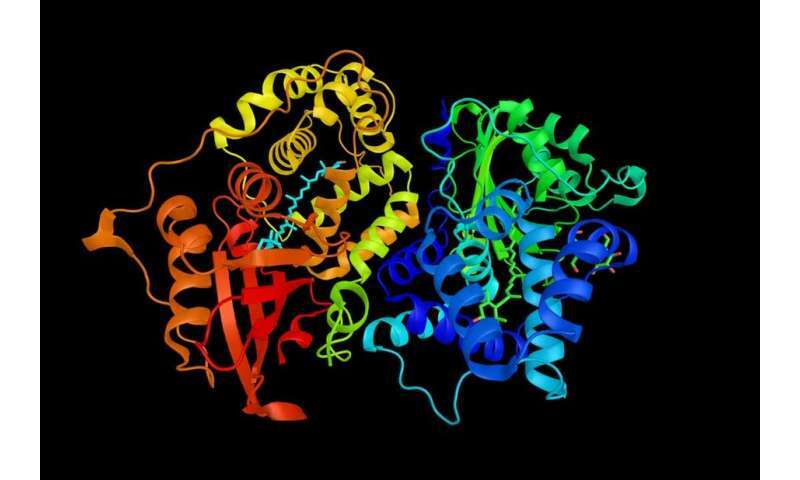 This allows the orange carotenoid protein to "dock": it binds tightly to the antenna so it can start to effectively remove dangerous excess energy. This step was completely unknown and could only have been accessed using single molecule spectroscopy.